Cerebral palsy (CP) is a group of disorders characterised by motor and/or postural dysfunction of a non-progressive nature commonly associated with cognitive impairment. The prevalence of CP is 2/1000 live births1, with principal obstetric risk factors being preterm birth (particularly less than 34/40) and very low birth weight (less than 1500g).2 Obstetric contributors include chorioamnionitis, antepartum haemorrhage, complications of multiple pregnancy, placental insufficiency and, less commonly, perinatal asphyxia. Neonatal intraventricular haemorrhage and periventricular leucomalacia are risk factors for CP and are inversely associated with gestational age. CP is a continuing major disability and carries a huge emotional and financial cost to the patient, their family and the wider community. The cost of CP to the Australian community is A$3.87 billion per annum.3 To date, there have been limited antenatal strategies to prevent this devastating outcome, but encouraging results from several large and well-designed trials4,5,6,7,8 and subsequent meta-analyses9,10,11 confirm that administration of magnesium sulphate improves the neurodevelopmental future of fetuses destined to deliver preterm. Magnesium sulphate: How does it work? The vasoactive properties of magnesium may result in increased cerebral blood flow due to cerebral vasodilatation, thus minimising hypoxic-ischaemic damage. Given the varied pathophysiologies associated with preterm birth, it is likely that one or more of these mechanisms may be responsible for neuroprotection in any given clinical circumstance. As early as 1992, Kuban first reported that administration of magnesium sulphate was associated with a reduction in intraventricular haemorrhage (IVH) from 18.9 per cent to 4.4 per cent in babies under 1500g.15 The case control study of Nelson and colleagues confirmed a reduction in CP (odds ratio 0.14) among infants under 1500g if the mother had received magnesium sulphate in labour.16 These observations, together with the animal data referred to above, were the basis of a series of prospective interventional trials to evaluate the impact of magnesium sulphate on CP. The objectives of the Cochrane review were to assess the efficacy and safety of magnesium sulphate as a fetal neuroprotective agent for women at risk of preterm birth. 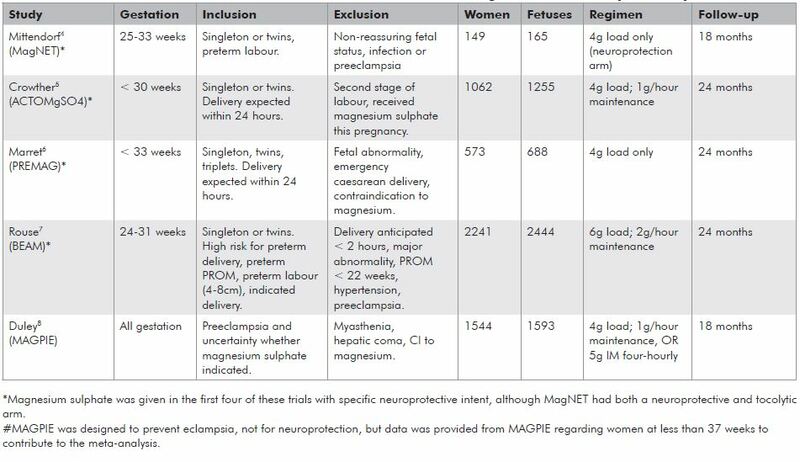 The review encompassed all five trials, thereby involving 6145 pregnancies in which women at risk of preterm birth at less than 34 weeks gestation were randomised to either magnesium sulphate or placebo. A further subgroup analysis was performed involving those trials which had used magnesium sulphate for ‘neuroprotection intention only’. This involved four trials and 4446 children, having excluded the MAGPIE Trial and a subset of patients receiving magnesium sulphate for tocolysis in MagNET. The primary outcome (paediatric) was the composite outcome of death, severe neurological impairment (cerebral palsy, neurodevelopmental delay, blindness and deafness), or both. Antenatal magnesium sulphate had no overall significant effect on mortality (fetal, neonatal and later) (RR 1.04; 95% CI 0.92-1.17). This was an important negative finding since concerns were raised from one of the earlier trials that the reduction in CP may have been achieved at the expense of increased death rates in the magnesium sulphate group. The finding was unaltered when confined to those where magnesium sulphate was given specifically for neuroprotective intent. Magnesium sulphate significantly reduced the risk of cerebral palsy (RR 0.68; 95% CI 0.54-0.87) and this remained significant when only the four trials in which magnesium with neuroprotective intent were considered (RR 0.71; 95% CI 0.55-0.91). A similar magnitude of risk reduction was seen for moderate to severe cerebral palsy (RR 0.64; 95% CI 0.44-0.92) and substantial gross motor dysfunction (RR 0.61; 95% CI 0.44-0.85). Although there was no significant effect for the composite outcome when all five trials were included (RR 0.94; 95% CI 0.78-1.12), there was a significant reduction among those given magnesium with neuroprotective intent (RR 0.85; 95% CI 0.74-0.98). How do these numbers translate into absolute risk reduction? There were no significant differences observed for the major maternal outcomes of death (RR 1.25; 95% CI 0.51-3.07), cardiac arrest (RR 0.34; 95% CI 0.04-3.26) or respiratory arrest (RR 1.02; 95% CI 0.06-16.25). Significantly more women ceased therapy in the magnesium group (RR 3.26; 95% CI 2.46-3.51). Of secondary maternal outcomes, magnesium therapy was associated with significantly more hypotension (RR 1.51; 95% CI 1.09-2.09) and tachycardia (RR 1.53, 95% CI 1.03-2.29). There were no differences seen in rates of maternal respiratory depression, postpartum haemorrhage or caesarean delivery. Table 1. Trial characteristics of the five randomised controlled trials contributing to the meta-analysis of Doyle et al. Antenatal Magnesium Sulphate Prior to Preterm Birth for Neuroprotection of the Fetus, Infant and Child.3 These guidelines can be accessed at: www.adelaide.edu.au/arch/antenatalMagnesium_SulphateGuidelines.pdf . a. Why stop at 30 weeks given that some of the trials continued up to 34 weeks? Although many of the studies addressed neuroprotection up to and including 34 weeks gestation, the decision to recommend 30 weeks was to some extent a pragmatic one. It was acknowledged that there are significant resource constraints in many maternity care settings. In addition, a more liberal upper limit of gestation would increase the absolute numbers of pregnant women who would be administered magnesium sulphate underthe guideline recommendations, and also an increased number needed to treat to prevent each case of cerebral palsy. Further trials to guide gestational age limits for magnesium sulphate are being considered and will hopefully provide better information in this area. b. What is the minimum necessary time of exposure for the fetus to receive benefit? the proposed mechanisms of action outlined above, it would seem that several hours would be optimal and the guideline pragmatically recommends that magnesium ideally be given for four hours prior to planned or anticipated preterm birth. Nevertheless, there will be many occasions where delivery is expected within four hours. under these circumstances, magnesium should still be given as there is still likely to be benefit. c. What about urgent delivery? Where there is maternal or fetal compromise necessitating urgent delivery, delivery should not be deferred for administration of magnesium sulphate. d. Should magnesium be repeated if delivery does not occur and there is a further episode where delivery under 30 weeks appears imminent? Although immediate repeat doses are not recommended, it is left to the clinician’s discretion whether to administer a further course when a recurrent presentation occurs, indicating that preterm birth is again planned or expected at less than 30 weeks. e. Many of these patients will also be receiving nifedipine for tocolysis. Is it safe to give both? Despite the potential for interaction between magnesium and nifedipine in terms of neuromuscular blockade and hypotension, this is rarely reported in practice. Nevertheless, maternal observations as recommended in individual units’ protocols for magnesium sulphate should be adhered to. If hypotension develops, both the magnesium sulphate and nifedipine should be ceased and medical review instituted. Despite the strength of the data presented for magnesium sulphate in fetal neuroprotection, there remain significant gaps in our knowledge and future research priorities have been indentified in the guideline. Some clinicians remain sceptical regarding the validity of the findings (given the heterogeneity of the trials [see Table 1] and the lack of statistical significance for their apriori primary outcome [death or disability]) and point to the need for further confirmatory data. This is a huge undertaking. For example, a further randomised controlled trial to confirm a reduction in moderate to severe cerebral palsy (assuming an incidence of CP of 3.5 per cent, 30 per cent risk reduction with magnesium sulphate and 80 per cent power, two-tailed alpha 0.05) would require 8000 women at less than 32 weeks gestation and 100 per cent follow-up. Enrolment of 2241 mothers in the trial of Rouse et al took ten years and cost uS$25 million!20 This highlights the difficulty in adequate powering for a trial with rare but important outcomes. Nevertheless, individual patient meta-analysis from the existing trials may give further insights into subgroups most likely to benefit and optimal administration regimens. Long-term follow-up of the trial participants is essential to ensure that findings at two years of age translate into improvements in long-term health outcomes in later childhood. Audit of implementation of this guideline is imperative and should be considered at a national level. Basic scientific research into the origins of preterm brain injury continues to inform future clinical avenues for fetal neuroprotection. Cerebral palsy is a major contributor to childhood morbidity, for which there is no known cure. As such, efforts must continue to focus on primary prevention. Significant gaps in our knowledge undoubtedly remain, but currently available evidence suggests that administration of magnesium sulphate prior to anticipated preterm birth minimises the risk of cerebral palsy among surviving infants. The American Congress of Obstetricians and Gynaecologists (ACOG) Committee opinion released in March 2010 concurs21 and recommends that clinicians electing to use magnesium sulphate for fetal neuroprotection develop guidelines surrounding its’ use, informed by the recent large trials. The Antenatal Magnesium Sulphate for Neuroprotection Guideline Development Panel goes one step further. There is now a readily accessible document summarising the research thus far and an evidence-based clinical practice guideline to assist clinicians and institutions with implementation. uptake of this guideline will be further enhanced by the already widespread knowledge and experience with magnesium sulphate in the setting of preeclampsia and awareness of the monitoring necessary to ensure maternal and fetal safety. In the future, individual patient meta-analysis of the existing trials may better inform us whether there are particular patient subgroups more likely to experience benefit and further clarify optimal timing and administration. Nevertheless, it is expected that broad implementation of the published guideline will reduce the burden of this devastating illness on those babies delivered preterm, their families and the community. Table 2. Summary of clinical recommendations. Stanley FJ. Trends in perinatal mortality and cerebral palsy in Western Australia, 1967 to 1985. BMJ 1992: 304: 1658-63. Himpens E, Van der Broeck C, Oostra A, Calders P, Vanhaesebrouck P. Prevalance, type, distribution and severity of cerebral palsy in relation to gestational age: a meta-analytic review. Dev Med Child Neurol. 2008 May; 50(5):334-40. Epub 2008 Mar 18. The Antenatal Magnesium Sulphate for Neuroprotection Guideline Development Panel. 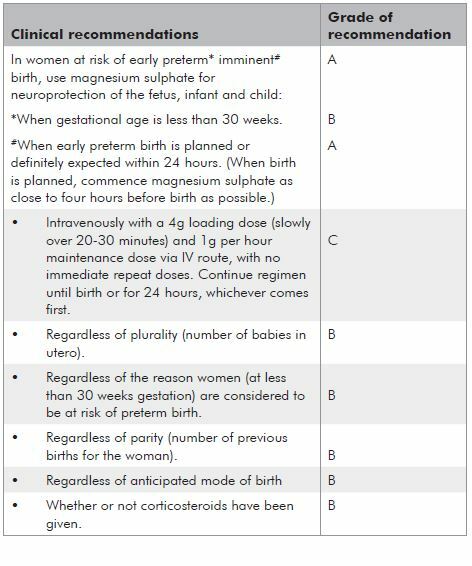 Antenatal Magnesium Sulphate Prior to Preterm Birth for Neuroprotection of the Fetus, Infant and Child: National Clinical Practice Guidelines 2010 Feb. Available at: www.adelaide. edu.au/arch/antenatalMagnesium_SulphateGuidelines.pdf . Mittendorf R, Dambrosia J, Pryde PG, et al. Association between the use of magnesium sulfate in preterm labour and adverse health outcomes in infants. Am J Obstet Gynecol. 2002; 186: 1111-8. Crowther CA, Hiller JE, Doyle LW, Haslam RR (ActoMgSO4 Collaborative group). Effect of magnesium sulphate given for neuroprotection before preterm birth: a randomised controlled trial. JAMA 2003; 290:2669-2676. Marret S, Marpeau L, Zupan-Simunek V, et al on behalf of the PREMA Trial Group. Magnesium sulphate given before very preterm birth to protect infant brain: the randomised controlled PREMAG trial. BJOG 2007; 114:310-318. Rouse DJ, Hirtz DG, Thorn E, et al for the Eunice Kennedy Shriver NICHD Maternal-Fetal Medicine units Network. A randomised, controlled trial of magnesium sulphate for the prevention of cerebral palsy. NEJM 2008; 359: 895-905. Conde-Agudelo A, Romero R. Antenatal magnesium sulfate for the prevention of cerebral palsy in preterm infants less than 34 weeks’ gestation: a systematic review and metaanalysis. Am J Obstet Gynecol. 2009 Jun; 200(6):595-609. Costantine MM, Weiner SJ, Shriver EK (NICHD). Maternal-Fetal Medicine units Network (MFMu). Effects of antenatal exposure to magnesium sulfate on neuroprotection and mortality in preterm infants:a meta-analysis. Obstet Gynecol. 2009;114:354-64. Doyle LW, Crowther CA, Middleton P, et al. Antenatal magnesium sulfate and neurologic outcome in preterm infants – a systematic review. Obstet Gynecol. 2009;113:1327-33. McDonald JW, Silverstein FS, Johnston MV. Magnesium reduces N- methy-D-aspartate (NMDA) – mediated brain injury in perinatal rats. Neurosci Lett. 1990 Feb 5;109(1-2):234-8. Burd I, Breen K, Friedman A, et al. Magnesium sulfate reduces inflammation-associated brain injury in fetal mice. Am J Obstet Gynecol. 2010;202:292.e1-9. Turkyilmaz C, Turkyilmaz Z, Atalay Y, Soylemezoglu F, Celasun B. Magnesium pre-treatment reduces neuronal apoptosis in newborn rats in hypoxia-ischemia. Brain Res. 2002 Nov 15;955(1-2):133-7. Doyle LW, Crowther CA, Middleton P, Marret S, Rouse D. Magnesium sulphate for women at risk of preterm birth for neuroprotection of the fetus. Cochrane Database of Systematic Reviews 2009, Issue 1. Art. No.CD004661. DOI:10.1002/14651858. CD004661.pub3. Sibai BM. Diagnosis, prevention and management of eclampsia. Obstet Gynecol. 2005 Feb;105(2):402-10. Hallak M, Cotton DB. Transfer of maternally administered magnesium sulphate into the fetal compartment of the rat: assessment of amniotic fluid, blood and brain concentrations. Am J Obstet Gynecol. 1993;169: 427-31. Rouse DJ. Magnesium sulphate for the prevention of cerebral palsy. Am J Obstet Gynecol. 2009; 200: 610-2. 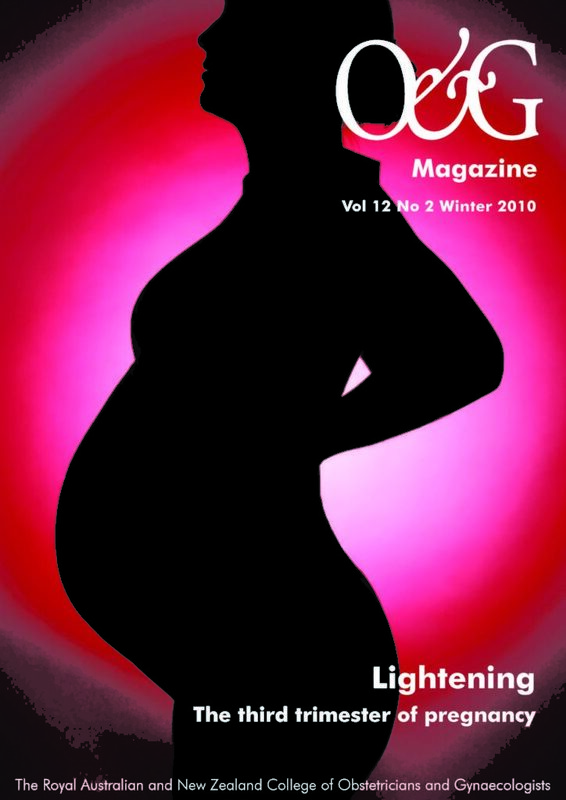 ACOG, Society for Maternal-Fetal Medicine. Committee Opinion No. 455: Magnesium sulphate before anticipated preterm birth for neuroprotection. Obstet Gynecol. 2010 Mar;115(3):669-71.